At a recent workshop, some useful web tools to engage students in learning have been introduced. Check them out and see if you can use them in your own classroom. Make your own avatar on www.voki.com. You can pick any character, add 60 seconds of your voice, then post it for your students to see. 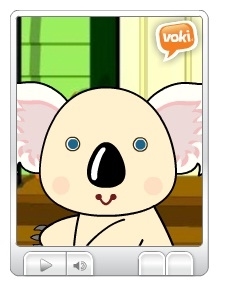 Some possible ways to use Voki can be for teachers to record directions on their Smartboard; email messages and/or directions to students' home;send holiday messages; record read-alouds from students (especially the shy or ELL ones) or teachers. Check out my avatar (Avatar) and listen to him read "Eating While Reading" by Gary Soto. If you want access to files from any computer, make an account on www.dropbox.com. It is a free file hosting service that lets you bring all your photos, documents, and videos anywhere. It's free for up to 2GB of data. Think about which level of Bloom's Taxonomy you wish to pursue then check out the tools available to get deeper with each level. The new revised edition of Bloom's Taxonomy are Remembering (Knowledge), Understanding (Comprehension), Applying (Application), Analyzing (Analysis), Evaluating (Synthesis), and Creating (Evaluation). The former Bloom's are in parentheses. Visit www.techsmith.com to download the software. Then use it to capture an image or a video to share instantly. You can model a lesson, record it, and replay it in class. If you find videos that you would like to add to your lessons and share with your students, use www.savevid.com to download the video at home then save it on a USB drive or dropbox to watch in school. It'll save you a lot of time! This website offers some free resources about the election, Summer Olympics and interviews with some famous writers. Each of those topics has news articles, research, activities and discussion ideas.